When looking for a true optical long range Thermal Imaging PTZ FLIR camera, TRUE long range, far distance detection needs to be closely examined due to misleading information in regards to real detection capabilities, in order to achieve usable EOIR imagery, very exotic optics must be utilized. The M series Long Range IR Thermal system uses very fast, low F rated continuous optical telephoto zoom Germanium optics to achieve true detection. SPI Can custom build your long range thermal imaging FLIR camera to meet your exact requirementsd and specifications. 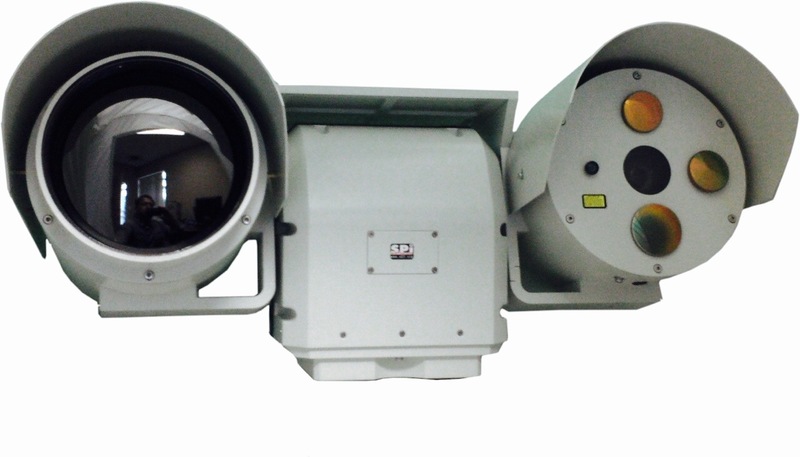 SPI HAS A LARGE SELECTION OF LWIR AND MWIR MULTI SENSOR PTZ FLIR SYSTEMS AVAILABLE AT THE BEST PRICE. WE CAN CUSTOM CONFIGURE A UNIT TO YOUR EXACT APPLICATION USING OUR OR YOUR SENSORS. The Video below illustrates 15 Mile HUMAN DETECTION ACTIVITY IN TOTAL DARKNESS. Long Range Thermal Imaging PTZ FLIR Thermal Camera system play a vital role in todays security, law enforcement, military and industrial arenas. The need to see at long distances in day and night is crucial for a wide variety of applications. PTZ FLIR Thermal Imaging Pan and Tilt thermal camera systems consist of rugged all weather housing and positioners that pan and tilt the camera housings. A plethora of sensor options are available with SPI M series camera that fill a void in wide (WSTI) Short (SRTI) Medium (MRTI) Long (LRTI) and Ultra Long (ULRTI) Detection, identification and detection Ranges. The Optional remote operated thermal flir PTZ camera also has long range slew to cue radar capabilities. SPI’s M Series PTZ FLIR Thermal cameras are FULLY UNIVERSAL AND COMPATIBLE WITH ANY SLUE TO CUE RADAR, EMERGENCY RESPONSE TACTICAL VEHICLES, NETWORK INTEGRATION SCENARIOS WITH WIRED, LOCAL, REMOTE, WIRELESS, IP, STREAMING, ONVIF, POE POWER OVER ETHERNET, ANALOG, ETHERNET, SOLAR, FIBER, MICROWAVE INSTALLATIONS. Our FLIR PTZ (Pan Tilt Zoom) Come in 2 sensor detector formats Long Wave Infrared (LWIR) and Mid Wave Infrared (MWIR). The Long wave will consist of an uncooled microbolometer detector and continuous zoom Germanium Lenses that go from 25mm to 255mm (coming soon 25 to 375mm). Our MWIR InSb or HOT detectors or cooled arrays consist of continuous zoom lenses from 25 mm to 2000mm. All of our detector arrays are hand selected to ensure the highest sensitivity and the highest performance with no bad pixels, and wide dynamic ranges. This ensures you the cleanest, crispest thermal FLIR imagery with sensitivity thats better than 1/10’th of a degree. The M7 gps Telescope FLIR thermal imaging LWIR uncooled PTZ camera can be custom configured to your exact application and specification, with a wide array of HD Telescope Thermal, NIR, SWIR, EMCCD, ICCD, CCD, CMOS, EBAPS, LWIR, MWIR & FLIR Optics, the M7 system will definitely suit your needs from medium, long to Very long range security, surveillance and imaging needs. If your application calls for high reliability pan/tilt PTZ FLIR, ultra extreme MWIR or LWIR PTZ FLIR long range day/night imaging system, then the M7 if your clear choice. There are many Long Range Imaging systems available in the marketplace, drawbacks is the high cost. The M7 Pan & Tilt Gimbal payload camera system is priced nearly half price of its competitors and offers true long range optronics imaging in low light, day and night. Laser Pointers/illuminators and rangefinders are all available in medium, long and very long ranges. The M7 Has a very rugged, sealed all weather 100% duty cycle metal payload PTZ FLIR Pan Tilt Positioner with zero backlash and extreme positioning precision. 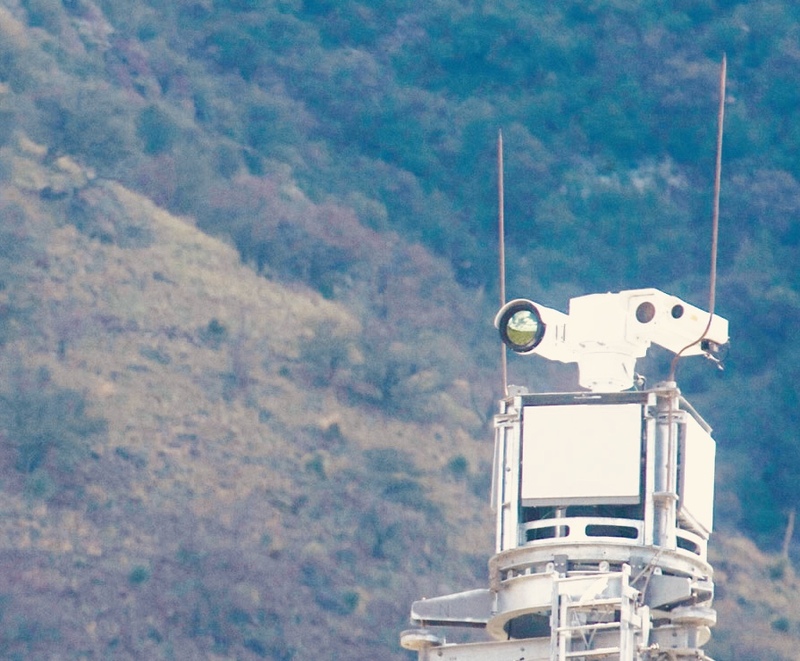 Additional features such as image fusion within multiple sensors, custom range detection, laser illuminator/pointers/designators and trackers as well as Laser Rangefinders can be incorporated into the M7 PTZ Payload Turret. ZOOM LENS OPTIONS IS AVAILABLE AT THIS LINK. Spi offers complete integrated PTZ FLIR camera systems that incorporate a multitude of sensors and target positioning and tracking features. Complimentary eo/Ir sensors include HD CCTV/tv/ccd visible cameras, x26 and x27 low light Mon and black and white digital night vision cameras, laser range finders (LRF), laser pointers and illuminators, SWIR or short wave infrared cameras, gps, radar, panoramic 360, Slew-to-cue, compass. A LINK TO VIEW THE M7 PTZ FLIR CAMERA SYSTEM IS AT THIS LINK. A selection of connectivity for on site or remote operation is available in many options like onvif, serial, Poe, ethernet, ip, fiber, microwave, cofdm, rs232, rs485, pelco, and a host of universal command and control options to suit your new or existing network. Unlike optical systems, which like the human eye requires light, thermal infrared flir imaging uses infrared electromagnetic radiation from the 3,000–14,000nm wavelengths or 3-14 microns (heat) to produce clean, crisp monochrome images even in complete darkness. Thermal cameras are extremely effective as humans, animals, and vehicles are all typically hot in contrast to their surroundings making them easily detectable by Lwir and Mwir ultra-sensitive thermal Ir cameras. 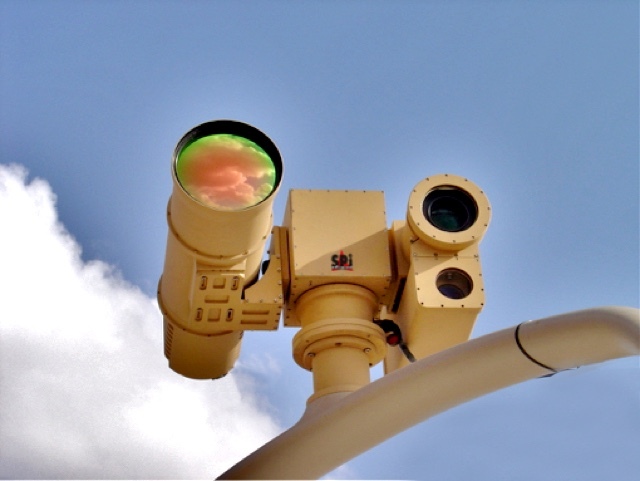 This allows Cooled and uncooled thermal cameras to detect threats at distances up to 35 kilometers, even in complete darkness and in harsh environments. Not only does thermal offer longer night vision ranges but it has advantages during the day as well. Standard visible CCTV/CCD cameras image is degraded by direct or reflected sunlight because they rely on contrast in order to identify targets of interest, In areas where contrast is poor optical cameras can be rendered useless and their performances change based on lighting conditions. Thermal imaging flir Ir camera technology, however, is completely immune to light allowing it to see in any lighting environment for 24/7 true day/night viewing. All objects that are above absolute zero (-273°C) emit infrared radiation. The amount of radiation emitted is proportional to the temperature of the objects. Thermal imaging detects these minute temperature variations and accurately reproduces the scene in a variety of pallets, most often in black and white greyscale. Since all objects emit infrared radiation a thermal FLIR imager is able to “see” the environment regardless of lighting conditions. Thermal energy passes through many optical obscurants including smoke, dust, modest foliage and fog. SPI’s Mwir and LWIR long range thermal cameras offer extreme continuous zoom thermal optical lenses that start off wide for a large area situational awareness coverage , making them perfect for 24/7 target detection and identification. 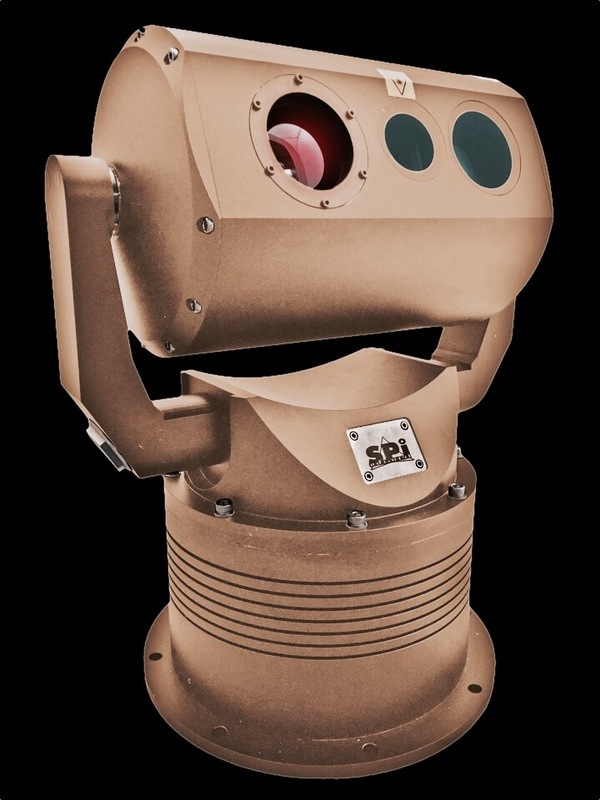 SPI’s thermal cameras provide state-of-the-art protection and a dynamic and versatile solution ideal for a host of applications including, but not limited to, security and surveillance, marine navigation, perimeter security, border/frontier security, military/defense tactical imaging, coastal protection and homeland security. Thermal imaging is a passive technology meaning that, unlike other night vision technologies, thermal does not artificially increase light or require any illumination or light source. This is extremely important as standard IR illumination emits a faint red glow which can allow intruders to find possible blind spots in your surveillance system. There are many applications that require stealth, such as SWAT teams, investigation units, counter surveillance and military personnel who require their presence to be undetected in order to achieve their objective. Thermal is the best technology for these applications as it is a completely passive technology allowing you to conduct covert reconnaissance day or night. Cooled thermal imaging cameras are traditionally made out of Indium Antimonide (InSb) but recently Mercury Cadmium Telluride (MCT) or HOT MCT detectors are available as well. InSb and MCT are very similar; both require an integrated cryocooler, hence the name cooled camera, and come in 640×480 and higher 1280×1040 HD resolution variants. InSb detectors typically run at -40°C whereas MCT are around -20°C. Since thermal cameras work by using heat waves cooling the core exponentially increases the sensitivity increasing both range and performance. Cooled thermal infrared cameras are extremely sensitive to minute temperature differences allowing even a fraction of a degree temperature difference between a target and the background clearly visible. Cooled Mwir and LWIR flir cameras work on mid-wave infrared or MWIR and typically use wavelengths of 3-5μm (3,000nm–5,000nm). 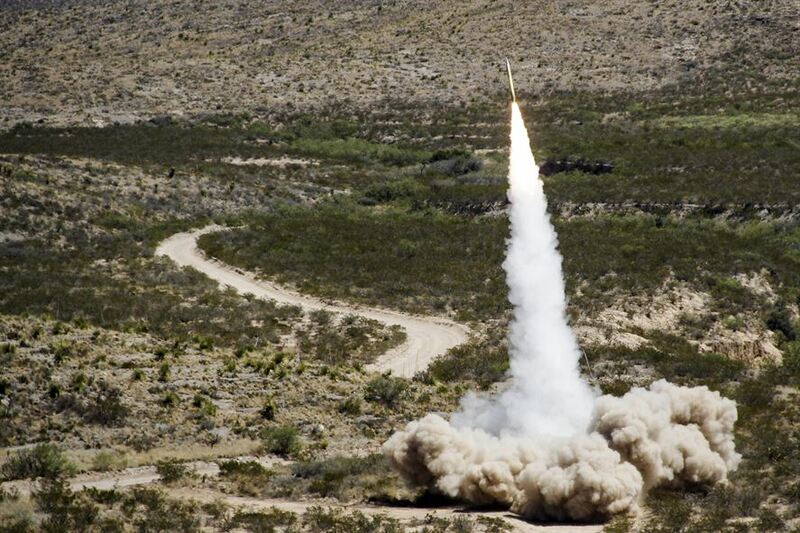 The combination of a cooled image core and the ability to work on the MWIR mid ave or medium wave spectrum results in ultra-long range detection capabilities up to 25 miles, even if there is only a few degrees temperature variance between the target and the background. While cooled cameras are a significant investment. and are considerably more expensive then uncooled, their superior range and performance allows them to replace a number of uncooled cameras making them a viable and cost effective solution for applications such as homeland security and coastal surveillance. Both cooled and uncooled thermal imaging Ir cameras have their advantages in the world of security/defense imaging. Uncooled LWIR thermal cameras are infrared cameras that do not require cryogenic cooling. A common detector design is based on the micro bolometer, or amorphous silicon, a tiny Vanadium Oxide (VOx) resistor with a large temperature coefficient on a silicon element with large surface area, low heat capacity and good thermal isolation. Changes in scene temperature cause changes in the bolometer temperature which are converted to electrical signals and processed into an image. Uncooled sensors are designed to work in the Long-Wave Infrared (LWIR) band from 7 to 14 microns (7,000nm–14,000nm) in wavelength where terrestrial temperature targets emit most of their infrared energy. Uncooled cameras provide can provide 10+ kilometer of detection and have no maintenance costs making them account for over 80% of all thermal cameras. Spi’s long distance/extreme far range thermal Ir cameras integrate specialty image enhancement algorithms that assist in bringing out the detail in cluttered and thermally balanced scenes. They aid in detection and identification of targets of interest at short/medium and long ranges. Video analytics is a desirable component in imaging systems. Video analytics allows us to add intelligence and automation to security cameras dramatically increasing performance and capabilities. Video analytics are widely used with optical cameras as optical cameras cost less and are more abundant than thermal cameras. This has been a major limiting factor to the effectiveness and performance of video analytics. As mentioned above, optical cameras require light and as a result the images they produce change with the lighting conditions. Video analytics detect changes in a scene and, through advanced algorithms, rules and user defined parameters, it intelligently creates alerts when an abnormal event causes a trigger. A common example is a trip wire where a user draws a perimeter and if any object crosses that perimeter it generates an alarm. In a more advanced and automated system this will move a PTZ (Pan Tilt Zoom) to the position of intrusions and even auto track the intruder. Optical cameras have a high false alarm rate because changes in lighting can trigger false alarms. Optical cameras are also limited to around 200 feet at night as they use traditional IR LED illumination. Thermal, however, is ideal for video analytics as it is immune to changing light. When properly installed, one thermal camera with SPI intelligent video analytics can cover up to 10 km of perimeter with an extremely low false alarm rate. 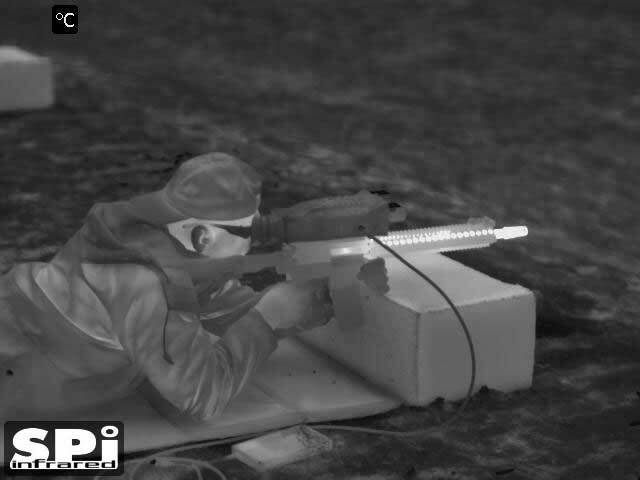 Since thermal flir imaging infrared cameras use heat (3μm–14μm spectrum) they do not use standard glass optics. Instead, they use a rare earth metal called Germanium (Ge). Germanium, because it is a rare earth metal, is much more expensive than regular see-through optical glass making Ge lenses much more expensive than their visible camera counterparts. 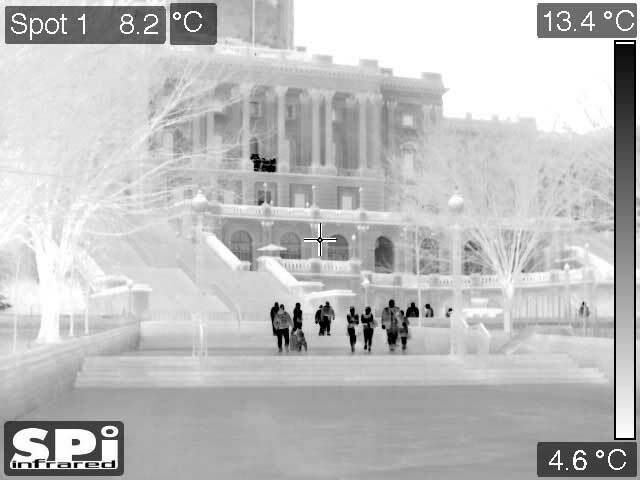 Due to their higher cost, thermal cameras tend to have a much smaller lens, and uncooled cameras usually have a fixed lens that does not exceed 300mm. Germanium is not as efficient at delivering heat to a thermal sensor as optical cameras are at delivering light to a visible sensor because of the Ge refractive index. This means the larger the lens the more heat loss that takes place resulting in lower performance and range. This is why Ge lenses are often smaller and continuous zoom lenses offer less performance then fixed lenses especially at focal lengths greater than 150mm. This is not to say that thermal zoom lenses do not have merit as they allow you to gradually zoom throughout the whole focal length while staying in focus. However this advantage comes at a cost of range and performance. Our systems are applicable for STAR (Surveillance, target acquisition, and reconnaissance), RSTA (Reconnaissance, surveillance and target acquisition), STA (Surveillance and target acquisition), and ISR (Intelligence, surveillance and reconnaissance), The long range CZ zoom lens of a LRTI Mwir and LWIR thermal imaging camera is a key component to the entire system and in most cases is the driving factor for the cost of the camera.